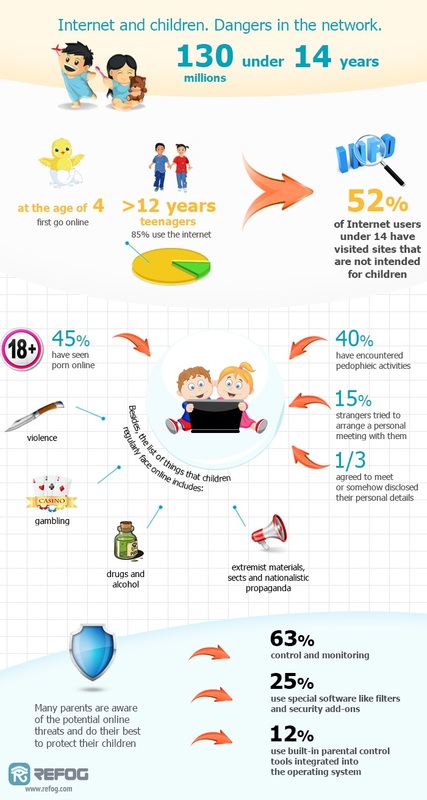 Monitoring your children’s time online has become a necessity due to the many different applications and risks that are freely available when you log onto the Internet. For this reason, Refog has created parental control software that help you to guard your child’s safety while controlling how much time they spend on applications such as online games. If your children spend too much time in front of the computer chatting and playing online games this increases the chances that they will be inevitably approached by a stranger in cyberspace. Because it is so easy to be anonymous on the Internet many predators can easily discover your child’s interests and then pose as a friend of the same age. Online criminal activity is a lot more sophisticated than the old forms of dumpster diving and prowling the streets. For this reason, it is essential to use parental control software to get around a criminal’s online anonymity, preserve your child’s safety, and provide yourself with piece of mind. Refog has been providing safety solutions software since 2002 and some of the more recent parental control software is easy for you to configure and provides you with better control over your child’s online activity. There is parental control software that provides protection for a variety of purposes and depending on what your concerns are with regard to your child’s computer activity. If your child is spending loads of time and you are concerned about what they are doing, Refog makes a personal monitor parental control software solution that is capable of recording keystrokes and all data that your child enters on the computer. This includes chat conversations and email messages as well as social networking chat programs. If you use this aspect of child monitoring it is a good idea to discuss this with your child so they understand that you are doing it because you care about their safety as opposed to violating their personal boundaries. Personal monitoring software by Refog is also capable of recording the history of websites visited and taking screenshots of all user activity. If you choose not to let your child know that you are monitoring their activity for any reason there is a way to make the parental control software invisible so it cannot be found in the Control Panel, Program folder, or desktop tray. Additionally, you can log both incoming and outgoing messages from all of the major instant messaging software applications and control the levels of monitoring for different users. Next to using chat, gaming is the biggest reason your child may spend hours on end in front of the computer and some of the games contain inappropriate content not to mention providing chat rooms with each game that are prime targets for predators. By using parental control software that allows you to control the time your child spends with specific applications you can limit the time that they spend playing games instead of doing homework. Refog just released a parental control solution that allows you to configure the amount of time your child spends on particular applications. Once the time has expired, their access will be terminated so they can play one of their favorite games for a while but not for too long. This type of software solution allows you to view a log that clearly shows who used the computer, when it was used, what applications they ran, and how much time was spent on each application. This way you know if your child was playing games in lieu of doing homework and you can restrict their access to the applications that may pose a safety risk such as games with chat rooms. Parental control software with time limitations works via Windows access control so you can customize the settings for each user account on the computer. The software has password protected access through a master password which makes it difficult for your child or any other users to alter the parental control settings. Refog offers a free evaluation copy of the software so you can give it a test spin before you decide to purchase.